Facing many challenge early in life, Hilda Hellums Baker turned to God to help her get through. She was inspired by her journey, and sought to use her story to help others. Thus, in 1996, she founded Cross Roads Retreat and Conference Center, Inc., a nonprofit organization dedicated to helping people get away from the city and remove distractions so they can reconnect with God. Although the original mission was to focus on teenagers and youth groups, they now cater to more adult groups. When Ms. Baker isn’t working with Cross Roads, she is looking for other ways to share her experiences. She has been a Christian inspirational speaker since 2012, and offers, in her own words, “testimony that challenges the imagination.” She is also the author of a book, “Stand at the Cross Roads,” which she feels is a testament to the good work God has done for her, and of the blog, Blogging UpWords. 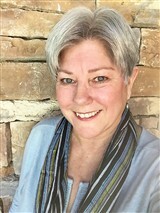 Further, Ms. Baker is a founding member of the Area 3:16 Church in Caldwell, Texas, and is affiliated with the Brazos Valley Emmaus Community. An asset to her endeavors is her fluency in Spanish. In her spare time, Ms. Baker enjoys spending time with her friends and family, particularly her eight grandchildren, fishing, and gardening. She also likes horses, chickens, and puppies.